Update: October 29, 2010 There is one more difference – More information about Family Tree Maker 2010 for Mac. The $99.95 version at Amazon.com, Amazon.co.uk, etc. has the “Family History Toolkit” which is a collection of ebooks on a DVD. There is no difference in the software between the Ancestry.com and Amazon.com versions! I’ve gotten several questions about just what is the difference between the retail version of Family Tree Maker for Mac and the version you can buy at Ancestry.com (which is 20% off). The short (and long) answer is it’s simply a matter of an Ancestry.com subscription. The retail version, such as what we see at Amazon.com which normally runs $99.55, as well as the retail version in the UK such as Amazon.co.uk (United Kingdom) which is normally £59.99 (on sale for £46.99) includes a 6-month subscription to Ancestry.com. The Ancestry.com version linked above does not have this subscription and sells for $69.95. It makes perfect sense from that perspective. I do have more questions submitted to the folks behind FTM and will post the responses as I get them. I am slowly but surely working through the back-log of questions I’ve received from people who follow this site, and will get them answered and posted either in a new article, or through the Frequently Asked Questions (FAQ) as time permits. If you’ve asked me a question through the contact form or directly through email, rest assured you will get a response soon. I’ve answered probably 50 emails in the past week alone. If you have a question, please send me a note through the contact form and I’ll get you a response. Synium Software has updated their Mac OS X genealogy software, MacFamilyTree 6.0, to MacFamilyTree 6.0.8. If you need to export a GEDCOM file, such as sharing with a family member or important into online genealogy software, then this update is highly recommended as there are several fixes in the GEDCOM Exporter tool. There are quite a few other fixes and updates and improvements in 6.0.8. If you are an existing MacFamilyTree 6.0 owner or user, you should be able to download it automatically. If you want to download and try MacFamilyTree 6 in a demo mode, or you just want the full version, you can download it from: Synium Software. mode. There is a new version of iScrapbook out from Chronos, iScrapbook 3.0.7. iScrapbook is exactly what it sounds like – digital scrapbook software for Apple’s Mac OS X or creating and organizing scrapbook projects. 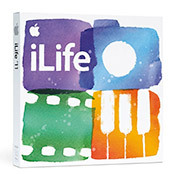 It requires Mac OS X 10.5.8 and is $49.99 for the single-user license. A fully functional trial version can be downloaded at the links below. First off, thanks to Gary and J for emailing me about it. Family Tree Maker is now available for pre-order through a few places (links below). We did know that it would be available before the end of November, and that looks to be accurate. The pre-order information says early November. I have updated the FAQ for Family Tree Maker for Mac to reflect the information below. It might make an appearance at some of the retail stores that Family Tree Maker for Windows is sold at, such as Best Buy, Fry’s, etc. I had hoped that we’d hear a lot more about Family Tree Maker for Mac at today’s Back to the Mac event held by Apple. The return of Autodesk’s AutoCAD was heralded by Apple at the event today and it had been quite a while since AutoCAD had been available on the Mac platform (longer than Family Tree Maker). I guess it makes sense that FTM for Mac wouldn’t be as prominently mentioned – when AutoCAD went Windows-only, it left a huge hole in the Mac software lineup. With genealogy software, there has been a strong and steady presence on the the Mac platform, including through the transition of Mac OS 9 through Mac OS X, so FTM leaving Mac didn’t cause as much of a stir as AutoCAD did. I will say this, with half of new Macs going to first-time buyers, Family Tree Maker for Mac couldn’t have come at a better time. I’m hoping to get this clarified soon, but on the Ancestry.com site it mentions Family Tree Maker 2010 for Mac, while the PC/Windows version is at 2011. Ancestry.com had told us that it would be at the same level as the PC version, so it doesn’t make sense that they would release the 2010 version right after the 2011 version for Windows came out. I’m going to assume that it’s just remnants of the original 2010 promotional material. When FTM for Mac was announced, FTM 2011 for Windows hadn’t been announced. * Scan images directly into FTM from a digital scanner. 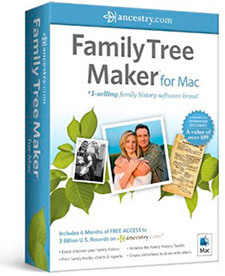 You can bring files into Family Tree Maker 2010 for Mac directly from Family Tree Maker version 4 through Family Tree Maker 2006. To import files from Family Tree Maker 2008 or a newer version, simply use the Windows-based conversion tool included on the Family Tree Maker for Mac disk. That may seem a little odd, but basically before you import the information from the Windows version, you run the Windows-based tool on the data and it will generate the specific information for the Mac version of FTM. So it might be that PowerPC users are left out. Earlier today I provied some live coverage of Back to Mac and now I want to mention a few things. I was curious to see if there would be an iWork update. There was not. Not too surprising. This was the big thing to me in the short-term. I like what I saw with iPhoto. I use iPhoto to organize things and to do slideshows they’ve improved both. The new full-screen modes are nice, as are the slideshow themes. The Letterpress cards and the book improvements..I’ll have to see the Letterpress cards in person before deciding, but they looked impressive in the demo. I have ordered cards through Apple before and was very pleased with the quality. The books I’ve put together wouldn’t really benefit from the improvements announced today – usually they are photos from different events and dates. Emailing from within iPhoto is definitely nice. I do like the “Project view” which resembles a book shelf that stores your projects/books/cards. The audio editing and the One Step Effects looked interesting. I could see the One Step Effects being used in a few areas in some family videos to maybe highlight something. The people finder that was brought in from iPhoto was the most interesting thing to me. That might be handy depending on how it works. The movie trailers could be a really fun thing, especially for younger family members. I’m surprised they didn’t have this available with then iPod touches with FaceTime shipped, but it’s a very welcome addition. I liked what I saw with the Launchpad and Mission Control apps. Some of the full-screen stuff was interesting, but I’m still not completely sold on it. Full-screen is nice though when it’s properly utilized. It’s not going to be available until Summer of 2011, so we’ll see. I’m interested in what I didn’t see today. I don’t have a strong opinion either way. I think it could be really handy for people who are new to Macs, and going by the sales presentation at the beginning of the event today, half of new Macs are being bought by first-time Mac owners. It could also encourage more developers who have had favorable experiences with the App Store on the iOS devices.